(Nanowerk News) The idea of computing systems based on controlling atomic spins just got a boost from new research performed at the Massachusetts Institute of Technology (MIT) and the U.S. Department of Energy's (DOE) Brookhaven National Laboratory. By constructing tiny "mirrors" to trap light around impurity atoms in diamond crystals, the team dramatically increased the efficiency with which photons transmit information about those atoms' electronic spin states, which can be used to store quantum information. Such spin-photon interfaces are thought to be essential for connecting distant quantum memories, which could open the door to quantum computers and long-distance cryptographic systems. Crucially, the team demonstrated a spin-coherence time (how long the memory encoded in the electron spin state lasts) of more than 200 microseconds—a long time in the context of the rate at which computational operations take place. A long coherence time is essential for quantum computing systems and long-range cryptographic networks. 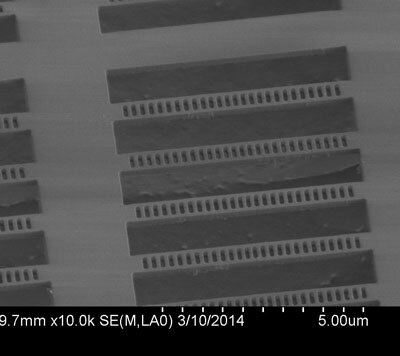 "Our research demonstrates a technique to extend the storage time of quantum memories in solids that are efficiently coupled to photons, which is essential to scaling up such quantum memories for functional quantum computing systems and networks," said MIT's Dirk Englund, who led the research, now published in Nature Communications ("On-chip detection of non-classical light by scalable integration of single-photon detectors"). Scientists at the Center for Functional Nanomaterials (CFN), a DOE Office of Science User Facility at Brookhaven Lab, helped to fabricate and characterize the materials. The memory elements described in this research are the spin states of electrons in nitrogen-vacancy (NV) centers in diamond. The NV consists of a nitrogen atom in the place of a carbon atom, adjacent to a crystal vacancy inside the carbon lattice of diamond. The up or down orientation of the electron spins on these NV centers can be used to encode information in a way that is somewhat analogous to how the charge of many electrons is used to encode the "0"s and "1"s in a classical computer. The scientists preferentially orient the NV's spin, whose direction is naturally randomly oriented, along a particular direction. This step prepares a quantum state of "0". From there, scientists can manipulate the electron spins into "1" or back into "0" using microwaves. The "0" state has brighter fluorescence than the "1" state, allowing scientists to measure the state in an optical microscope. The trick is getting the electron spins in the NV centers to hold onto the stable spin states long enough to perform these logic-gate operations—and being able to transfer information among the individual memory elements to create actual computing networks. "It is already possible to transfer information about the electron spin state via photons, but we have to make the interface between the photons and electrons more efficient. The trouble is that photons and electrons normally interact only very weakly. To increase the interaction between photons and the NV, we build an optical cavity—a trap for photons—around the NV," Englund said. These cavities, nanofabricated at Brookhaven by MIT graduate student Luozhou Li with the help of staff scientist Ming Lu of the CFN, consist of layers of diamond and air tightly spaced around the impurity atom of an NV center. At each interface between the layers there's a little bit of reflection—like the reflections from a glass surface. With each layer, the reflections add up—like the reflections in a funhouse filled with mirrors. Photons that enter these nanoscale funhouses bounce back and forth up to 10,000 times, greatly enhancing their chance of interacting with the electrons in the NV center. This increases the efficiency of information transfer between photons and the NV center's electron spin state. The devices' performance was characterized in part using optical microscopy in a magnetic field at the CFN, performed by CFN staff scientist Mircea Cotlet, Luozhou Li, and Edward Chen, who is also a graduate student studying under the guidance of Englund at MIT. "Coupling the NV centers with these optical resonator cavities seemed to preserve the NV spin coherence time—the duration of the memory," Cotlet said. Added Englund: "These methods have given us a great starting point for translating information between the spin states of the electrons among multiple NV centers. These results are an important part of validating the scientific promise of NV-cavity systems for quantum networking." In addition, said Li, "The transferred hard mask lithography technique that we have developed in this work would benefit most unconventional substrates that aren't suitable for typical high-resolution patterning by electron beam lithography. In our case, we overcame the problem that hundred-nanometer-thick diamond membranes are too small and too uneven. " 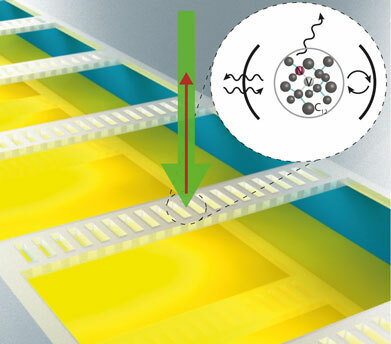 The methods may also enable the long-distance transfer of quantum-encoded information over fiber optic cables. Such information could be made completely secure, Englund said, because any attempt to intercept or measure the transferred information would alter the photons' properties, thus alerting the sender and the recipient to the possible presence of an eavesdropper.